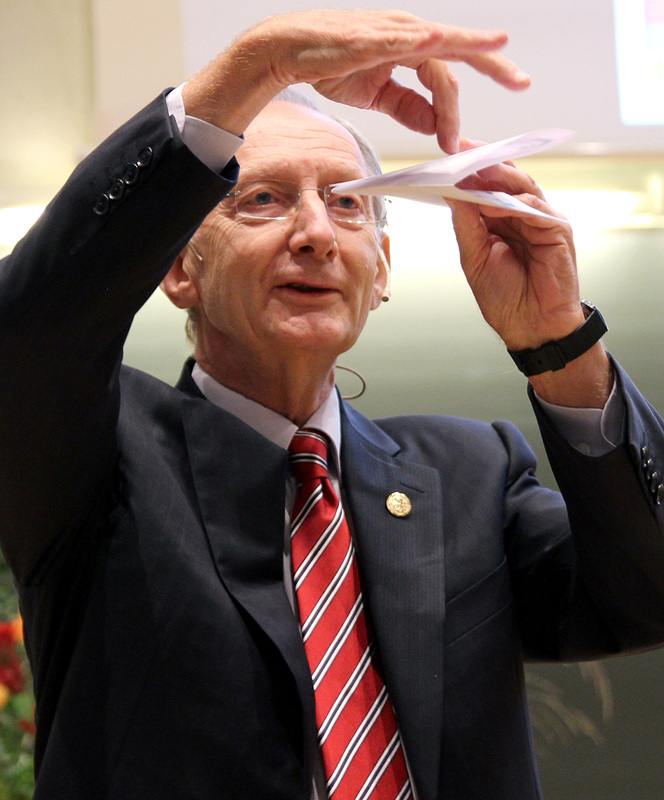 Last week, NTNU hosted the Kavli Prize Laureate in The Natural Science Building (Realfagbygget) and there were some very succesful scientists and prize winners present. The prestigious Kavli Prize was established in 2005 by The Kavli Foundation in cooperation with The Norwegian Academy of Science and Letters and The Norwegian Ministry of Education and Research. The prize is named after Fred Kavli a successful business leader, inventor, and philanthropist from Norway. Kavli (1927-2013) received his engineering degree from NTH in 1955 and moved to the USA shortly after. The prize recognizes scientists with outstanding research results in astrophysics, nanoscience and neuroscience and award three prize winners from each field every second year. The Natural Science Building was the host for the Laureate for nanoscience and neuroscience. The prize winners receive a check for one million US dollars for each research field, a gold medal and a diploma. The prize has wide international recognition and the American president traditionally welcomes the American recipients to the White House. Brenda Milner, a 96-year-old professor at McGill University in Canada, stole the show this day. 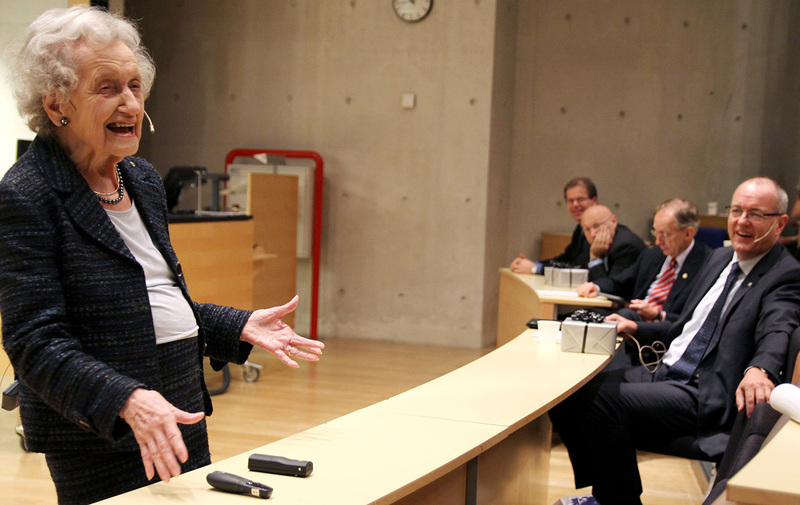 This charming and lively lady received the Neuroscience prize. Her lecture “Memory, looking back and looking forward” was very popular and everyone was impressed by her chipper demeanor. Milner is considered a pioneer in neuropsychology and memory research. She is most famous for her studies on the patient Henry Molaison known as H.M. He had undergone a bilateral temporal lobectomy (brain surgery) that included removal of major portions of the hippocampus. H.M. was not able to remember new events after the operation, but he was able to learn new motor skills. Milner’s research led to theories that can explain the link between brain function and memory, and contributed to the development of cognitive neuropsychology. Norwegian scientist, Thomas Ebbesen now residing in France at the University of Strasbourg was the first Norwegian Kavli Prize winner. He received the Kavli Prize in nanoscience. His biggest contribution to science is in optical transmission. Another nanoscience winner was physicist Stefan W. Hell from Max Planck Institute for Biophysical Chemistry in Göttingen, Germany. Hell is a big contributor to microscopy technology. Sir John Pendry, theoretical physicist from the Imperial College of London was also a nanoscience Prize recipient. He had an interesting lecture on invisibility. Pendry became famous for creating a container that can reflect light in a fashion where objects can become invisible, a so called invisibility cloak. Invisibility cloaks are very popular in science fiction and appear in the books of Harry Potter. The Natural Science Building also hosted the Kavli Prize Symposium in Nanoscience in the afternoon. Among the speakers was Sir Andre Geim from The University of Manchester. 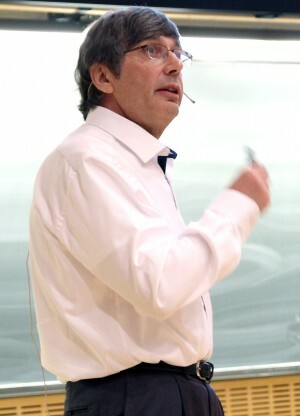 Geim is part of the duo that received the 2010 Nobel Prize in Physics for the method of isolating graphene. Graphene is a one-atom thin layer of carbon, 100 times stronger than steel and with great conductivity properties. Other speakers at the symposium included Bo Brummerstedt from Aarhus University, Molly Stevens from Imperial College of London and Ke Lu from The Chinese Academy of Science in Shenyang. This day was one of many interesting opportunities that students have to see absolute world class scientists at NTNU. This opportunity is unique and students should definitely take the chance to attend events like this. I am Nathalie from Belgium, the land of chocolate, waffles and beer. A few weeks ago I started my PhD here at NTNU. 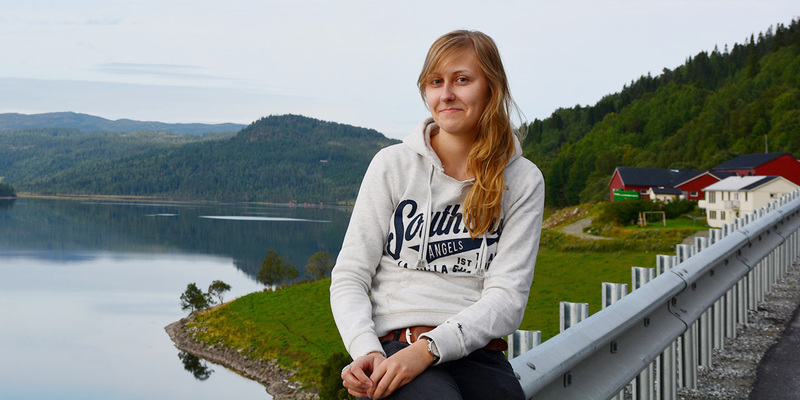 I am a member of the bird ecotoxicology group and will investigate the exposure and effects of emerging contaminants on White-tailed Eagle and Northern Goshawk. Over one year ago, I graduated with a Master of Science. Since then I have been looking for a job as a researcher, preferably abroad. It was not as easy as I first thought. But here I am, living my dream in a foreign country. I must say, it wasn’t easy to leave my family, friends and especially my boyfriend behind. But PhD opportunities don’t grow on trees, and I believe that chances like these don’t come often. I would have regretted to miss a chance like this. The support of my beloved ones was crucial and made the decision a lot easier. And I feel welcomed to NTNU by my very nice colleagues. Today, I feel privileged to fill my days with something I’ve wanted to do for such a long time. However, during these first three weeks of my PhD I’ve been mainly occupied by filling out forms and running around from one office to another. As a PhD student, I have – in addition to my research – 1680 hours of teaching to do during these four years. Although I get paid an extra year during my PhD because I take on these teaching duties, 1680 hours… That’s a lot! But luckily these are not all teaching hours. Also preparation time is taken into account, but still it was a shock to hear that I have to do all of this in combination with my research. This brings us to the endless discussion about the teaching duties of PhD students. I personally think it is a good practice in a way. It’s a necessary evil that provides us with a useful competence when working in an academic environment. But it should not stand in the way of our research of course. One thing I’ve learned in these first three weeks is that organization is very important. That will be the key to complete these four years of research successfully, I think. For the moment I still find it really difficult to keep myself focused on one task, because there are so many things that need to be done and this is only the beginning! I’m really looking forward to what these four years will have in store for me. And soon I will have my first close encounter with a bird of prey, wish me luck!